There was a series of posts yesterday here that made a range of claims and generalisations that were unsupported by evidence, and some were obviously wrong. I have no problem with things like immigration, culture, multiculturalism etc here, but want to detail some ground rules. If you comment on contentious issues in particular then back up your claims with facts. ‘Supporting’ links to overseas sites of dubious credibility will be viewed with suspicion – it can take time to check these out so they may be suspending pending time to deal with them, or deleted. ‘Multiculturalism’ has a variety of meanings and purposes so be specific about what you mean by it. the presence of, or support for the presence of, several distinct cultural or ethnic groups within a society. That applies to many countries, and has applied to New Zealand for decades if not centuries. The term multiculturalism has a range of meanings within the contexts of sociology, of political philosophy, and of colloquial use. In sociology and in everyday usage, it is a synonym for “ethnic pluralism“, with the two terms often used interchangeably, for example, a cultural pluralism in which various ethnic groups collaborate and enter into a dialogue with one another without having to sacrifice their particular identities. It can describe a mixed ethnic community area where multiple cultural traditions exist (such as New York City) or a single country within which they do (such as Switzerland, Belgium or Russia). Groups associated with an aboriginal or autochthonous ethnic group and foreigner ethnic groups are often the focus. In reference to sociology, multiculturalism is the end-state of either a natural or artificial process (for example: legally-controlled immigration) and occurs on either a large national scale or on a smaller scale within a nation’s communities. On a smaller scale this can occur artificially when a jurisdiction is established or expanded by amalgamating areas with two or more different cultures (e.g. French Canada and English Canada). On a large scale, it can occur as a result of either legal or illegal migration to and from different jurisdictions around the world (for example, Anglo-Saxon settlement of Britain by Angles, Saxons and Jutes in the 5th century or the colonization of the Americas by Europeans, Africans and Asians since the 16th century). So it is not just something that has happened over the last few years. Britain has had major cultural influences from the Romans, Vikings, Angles, Saxons, Jutes and French, and has major influxes of immigrants for centuries, notably in the 1800s when work and population expanded due to the industrial revolution. A nation state (or nation-state) is a state in which the great majority shares the same culture and is conscious of it. New Zealand has not been a ‘nation state’ since Europeans started settling here in numbers in the 1800s. That probably applies to everyone to some extent. That’s an ‘Anglo Australian’ superiority statement that applies fault only to others when a lot of the fault with “disparaging their culture and the legitimacy of their central place in national identity” is with those who see themselves as superior ‘Anglos’. It ignores an obvious fact – Aborigines. Their culture is unique and is probably the longest established culture (or cultures) in the world. It also ignores the fact that many other cultures other than ‘Anglo’ have been a part of the Australian mix for a long time. No it’s not. It is largely an attempt to reduce speech that is derogatory, divisive, inflammatory and harmful, and speech that promotes superiority rather than equal status. It’s going to be a challenging debate on a difficult issue. Only those who see themselves as dissenters claim that it is about shutting down dissent. An extreme version of this is those who claim that tightening up our lax gun laws is an attempt to shut down the ability of the population to violently oust a government – I have seen this alluded to at Kiwiblog and Whale Oil, with a UN conspiracy also being mentioned. That’s obviously nonsense. Polynesian culture is Aotearoa New Zealand’s founding culture, dating back about a thousand years. European culture has had a major impact over the last two centuries, but even that has been a diverse range of cultures. Other cultures made lesser but still notable impacts, like Chinese, Lebanese and Dalmatian. And over the last fifty years there have been major influxes of various nationalities and cultures, including a range of Polynesian cultures, Asian cultures (the first significant influx of Muslims was actually a mix of those two, Indian Fijians), South Africans, Chinese, Indian, Philippino and others. ‘European culture’ seems to be a euphemism for white superiority. Some seem to see ‘white’ as a superior class with a culture that must be preserved. Many of the white Anglos/Europeans who emigrated to New Zealand did so to escape the oppressive class system in England. You have to be careful about classing people as ‘white’ in New Zealand, many white looking people have a variety of racial and ethnic family histories. It’s somewhat ironic that those who promote their ‘white class’ as superior are of a small fringe of New Zealand society. Anyone wanting to promote what I perceive as some sort of white/Anglo/European superiority agenda will need to back up their arguments with sound reasoning and facts – and not cherry picked facts that distort the true picture. The more sweeping generalisations, unsupported claims and conspiracies that are made the less tolerance I will have for giving you an unmoderated forum. There is no cultural or ethnic majority in New Zealand. We are a diverse mix of cultures. Sure, some have been more prominent than others, but that doesn’t make them stand out on their own or superior or inferior. We need to value our uniqueness and our similarities whatever our ethnic or cultural background is. And we need to accept that all of this is changing. The culture I live in in my small corner of the country is significantly different to the one I grew up in, and in many respects it is richer and better. Even if I wanted to I couldn’t go back to what it was, it doesn’t exist any more. New at NZ History: Encounters – Discover stories of encounter between two great voyaging traditions, Polynesian and European, which led to the formation of a new nation. The Pacific Ocean was one of the last areas of the earth to be explored and settled by human beings. It was only around 3200 years ago that people began heading eastwards from New Guinea and the Solomon Islands further into the Pacific. New Zealand was the last significant land mass outside the Arctic and Antarctic to be settled. The Polynesian culture emerged in Fiji, Samoa and Tonga from the earlier Lapita culture, which had formed from the mixing of the Melanesian peoples already living in Near Oceania with migrants from the vicinity of Taiwan. 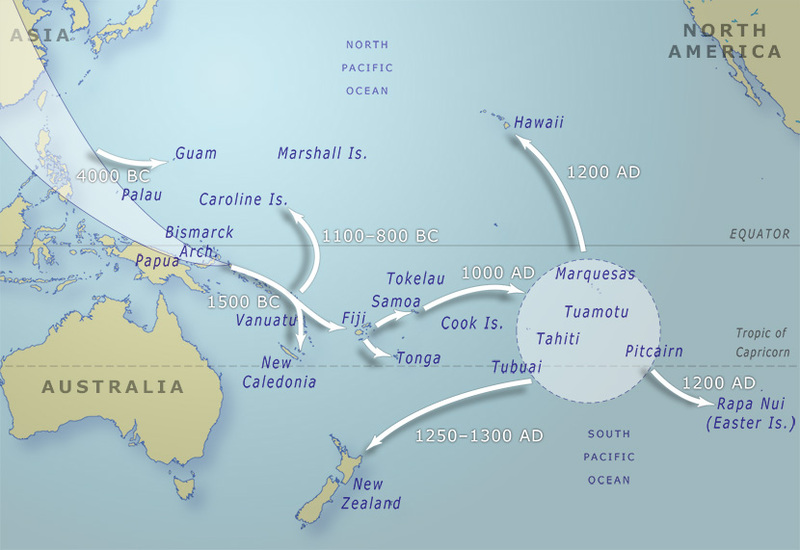 During the first millennium CE, Polynesians sailed east into French Polynesia and the Marquesas, before migrating to Hawaii (600 CE), Easter Island (700 CE), and New Zealand (1250–1300 CE), the far corners of the ‘Polynesian triangle’. Sometime between 1300 and 1550, Māori from New Zealand settled on the Chatham Islands (Rēkohu), more than 750 km south-east of the mainland. Portuguese and Spanish navigators sailed the Pacific Ocean in the 1500s, but there is no firm evidence that Europeans reached New Zealand before 1642. In that year the Dutch explorer Abel Tasman sailed in search of the vast continent which many Europeans thought might exist in the South Pacific. Dutch merchants hoped this land would offer new opportunities for trade. Tasman sighted New Zealand on 13 December 1642, but after a bloody encounter with Māori in what he called ‘Murderers’ Bay’ (now Golden Bay/Mohua) on the 19th, he left without going ashore. Tasman then sailed up the west coast of the North Island but did not establish how far east land extended. The Royal Society had proposed to the British Admiralty that the transit of Venus (the passage of the planet Venus across the face of the sun) be observed in the South Pacific. This observation, combined with others elsewhere, would make it possible to accurately calculate the distance from the Earth to both Venus and the sun. Lieutenant James Cook was appointed to command the expedition. Cook was approaching 40 and had 10 years’ experience in the Royal Navy, mostly in North American waters. Previous to the navy, Cook had worked in the coal trade, which turned out to be an advantage: the ship for the expedition was a former coal ship, a relatively small vessel of 368 tons, just 32 m long and 7.6 m broad. 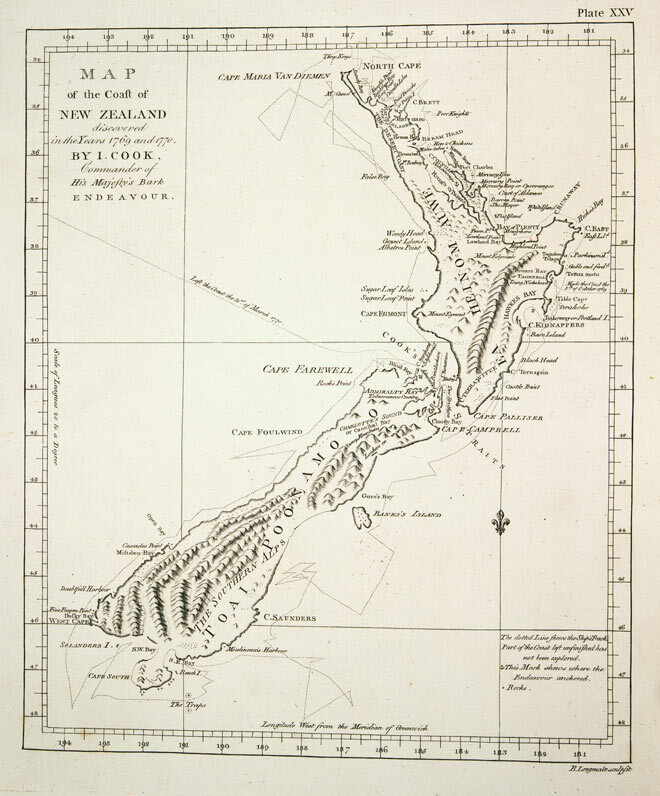 Once the planetary observations had been made, Cook’s expedition was to locate Tasman’s outline of New Zealand and establish how far it extended to the east. The Endeavour sailed south into uncharted waters and then west. On 6 October 1769, the surgeon’s boy sighted the high hills of Aotearoa. The people of Tūranganui-a-Kiwa were the first to meet Cook when he anchored. Conflict arose when the crew went ashore to seek water and supplies, and killed or wounded several Māori. Details of Cook’s first visit follow – theses have been well recorded and taught. On his second voyage (1772–75) Cook used New Zealand as a base for probes south and east which finally proved there was no such continent. The expedition had two ships: HMS Resolution, commanded by Cook, and HMS Adventure, commanded by Tobias Furneaux. Both ships sailed from England on 13 July 1772 and spent time in New Zealand waters between excursions into the unexplored parts of Antarctica and the Pacific. On his third voyage (1776–79) Cook again commanded the Resolution, with Charles Clerke in command of the Discovery. Cook paid a last visit to New Zealand, staying from 12 to 25 February 1777 at ‘our old station’, Ship Cove in Queen Charlotte Sound, before sailing into the north Pacific and through Bering Strait to the north coast of Siberia. He was killed in an avoidable incident at Kealakekua Bay, Hawaii, on 14 February 1779. On the evening of 18 December 1642, two waka of Ngāti Tūmatakōkiri people approached two strange ships, which had anchored near the north-western tip of the South Island. These ships, the Heemskerck and the Zeehaen, were commanded by the Dutch explorer Abel Tasman. This was the first known occasion when Māori encountered Europeans. 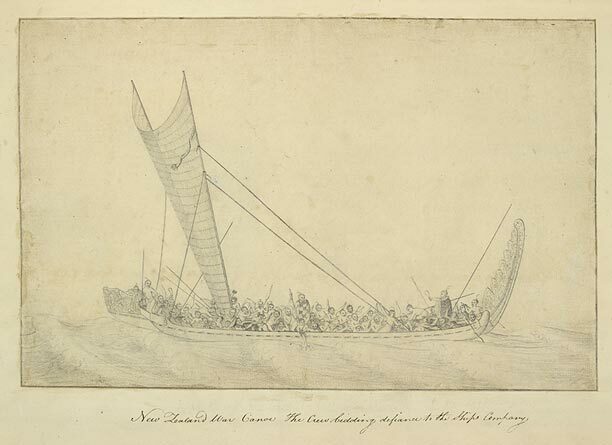 On this occasion the Māori group called out to the ships’ occupants and blew on a shell trumpet to challenge the intruders; the Dutch ship replied with their own trumpets. The next day, a waka approached with 13 Ngāti Tūmatakōkiri on board. They were shown gifts by Abel Tasman’s men, but returned to shore. Seven more craft then came out to the ships. A small Dutch boat, which was passing a message between the two ships, was rammed by one of the waka and its occupants attacked; four of the Dutchmen died. As the ships weighed anchor and set sail, 11 canoes approached and were fired on, possibly causing injuries. As a result of the incident, Tasman never landed on New Zealand shores, and named the place Moordenaars Baij (Murderers Bay). For almost 130 years, Europeans and Māori had no further contact with each other. Then on 8 October 1769, James Cook and others landed on the east side of the Tūranganui River, near present-day Gisborne. It appears from later accounts that the local Māori at first took the ship to be a floating island or giant bird. The fertile land surrounding the wide bay Tūranganui-a-Kiwa was home to a large population of Māori at that time, divided into four main tribes. Cook’s relationship with Māori got off to a disastrous start when a Ngāti Oneone leader, Te Maro, was shot and killed by one of Cook’s men. It seems likely that the local people were undertaking a ceremonial challenge, but the Europeans believed themselves to be under attack. 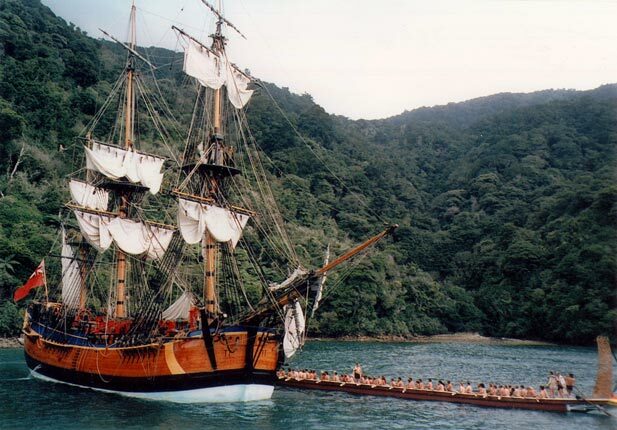 The replica of Cook’s Endeavour and the waka Te Awatea Hou – a waka taua built in 1990 – meet in Meretoto/Ship Cove in 1996, where Cook spent time on each of his journeys to New Zealand. While a small ship the Endeavour would have looked impressive to Māori, but the size of the waka is also impressive.